Nostalgia for 8 and 16-bit consoles is not something that I’m all that familiar with. The first game system I owned was the PlayStation, and the only games I played on it were piles of colorful 3D polygons like Spyro and Crash Bandicoot. Going back to emulators or classic consoles like the NES, SNES, Genesis, etc. to play seminal titles is something that I only rarely find the patience for. So when modern games try to invoke that sort of nostalgia, it’s often a toss-up for me: if the nostalgia is going to miss, then will the work actually hold up on its own merit? The Messenger goes a step farther than just holding up on its own merit. It truly commits to and celebrates its retro underpinnings, so much so that it not only plays off of nostalgia for NES classics — it actually feels nostalgic. It didn’t matter that I’d never really played most of its influences. It evokes such a great retro aesthetic that I never needed to recognize any specific callouts, and the game rarely felt the need to make them, either. 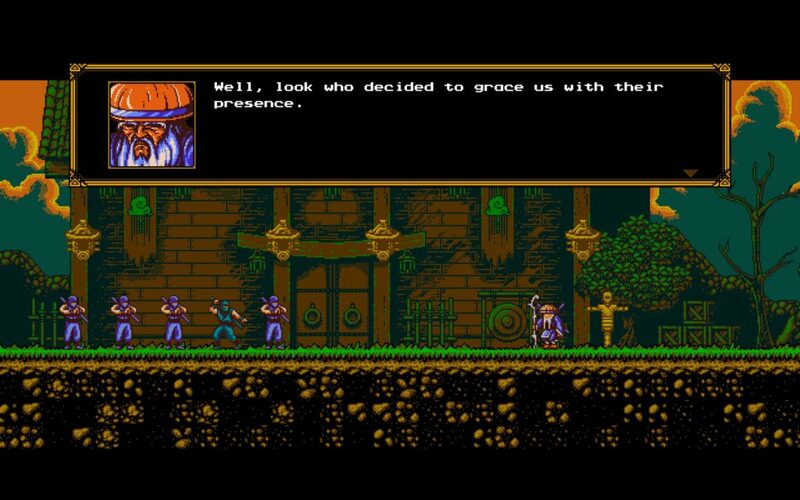 The Messenger is the debut title by Canadian developer Sabotage, out now on Steam and Nintendo Switch. It begins as a very linear action game, as the player embarks on a quest across his world, fighting demons and progressing from level to level. But after a while, a couple of plot twists morph the game into a more Metroidvania-style adventure. I hesitate to be too specific about when and how the game makes these shifts, because they’re one of the most delightful things about it. Suffice to say, though, that it combines its various ideas with supreme confidence, and some solid pacing keeps it interesting across its various acts. Of course, one thing you’ll know if you watch the trailer is that it features two overlapping worlds and aesthetics: one of them is a nod to 8-bit classics, and the other is inspired by their 16-bit successors. While a few of the broader systems of the game are imperfect (the shuriken ability is a bit underwhelming, and the difficulty curve has some odd hiccups), the majority of the game is a loving rendition of all of the things that make retro games wonderful and enduringly adored. The movement feels amazing, both tight and precise like its retro inspirations and also just as fluid and versatile as any modern action platformer. It manages to feel much smoother than retro titles but still invoke how it might have felt to play something like Ninja Gaiden for the first time, jumping between walls and slashing at enemies. This is emphasized by some really stunning art and an absolutely killer soundtrack by chiptune musician Rainbowdragoneyes (seriously — give this track from the first area a spin). 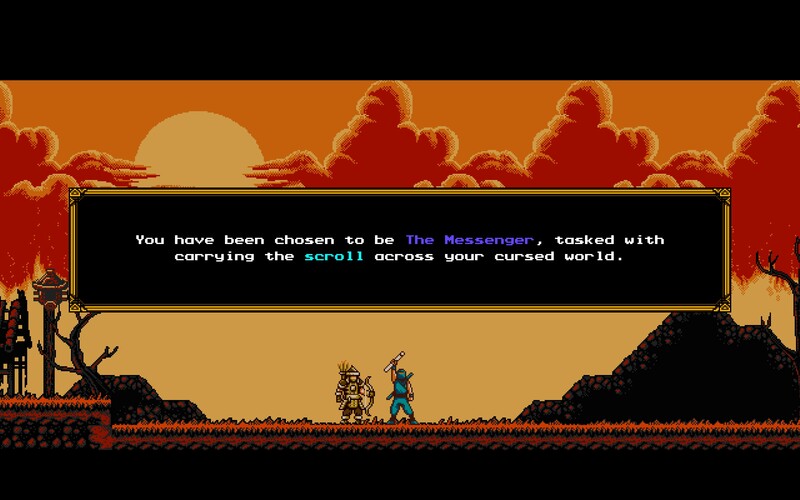 Aesthetically, The Messenger has the whole package, and that’s a big reason it’s such a joy to play through. Though the enemy variety is lacking, the game’s numerous areas are distinct and memorable, all of them meticulously designed to play interestingly into the traversal mechanics that the protagonist gains throughout his adventure. Interactions with NPCs have a lot of cheeky humor and fourth-wall-breaking, but manage to maintain their charm because of how trope-filled and fun the story itself is. This is especially refreshing in contrast to Guacamelee! 2, the game I played last week, which tried so much harder to be funny but came off as annoying and self-congratulatory. Rather, the writing in The Messenger is an extension of the same fun-loving retro ethos that it applies to its mechanics and aesthetics. It embraces goofy tropes and snarky dialogue in a way that feels charming and true to itself. The later sections of the game feature a lot of backtracking through areas that have changed slightly since they were last visited. While backtracking is just as rewarding as it often is in Metroidvanias, the game also takes the opportunity to provide some modern improvements via teleports and some in-game hint systems (similar to the Sheikah Stones that were added in the 3DS remake of Ocarina of Time). Another more modern addition is an upgrade tree to go along with the more plot-driven abilities, and it provides some very useful modifications to your character’s basic skills. That said, it could also have gone a little farther with modern touches. I wish there was more secrets to find aside from extra money or the single kind of collectible, and I would have loved to see some more variety in the later parts of the upgrade tree. I could also imagine the game having a couple more interesting traversal mechanics that could be granted later in the game. 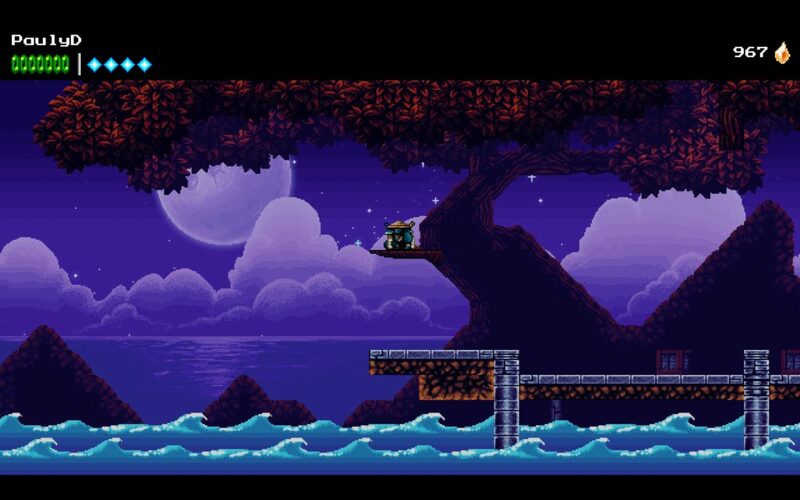 But despite these shortcomings in the overarching design, The Messenger is a testament not only to the power of retro nostalgia but to the generation of game designers it inspired. Its combination of crisp classic aesthetics with a modern sense of scale and polish make it a delightful experience, full of fun surprises and charming authenticity. Even with the ever-growing library of high-quality Switch titles, The Messenger is definitely worth your attention.